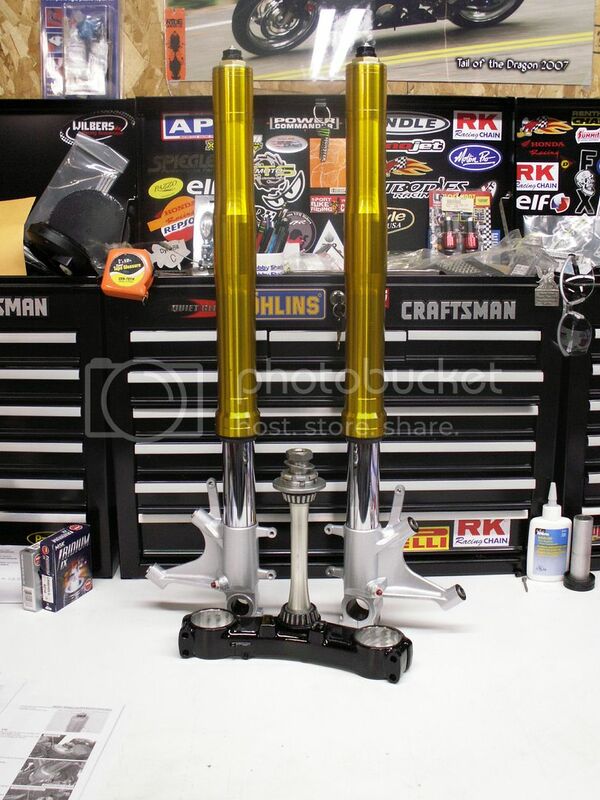 I painted a set of CBR 1kRR forks to look like fake Ohlins forks last night. Used House of Kolor Pagan Gold kandy on the uppers and HOK fine Orion Silver on the lowers. Wow ... That's nice Seb. In My Garage::1998 Honda VFR800Fi, 2013 BMW K1600GTL, 1978 Yamaha DT400E. 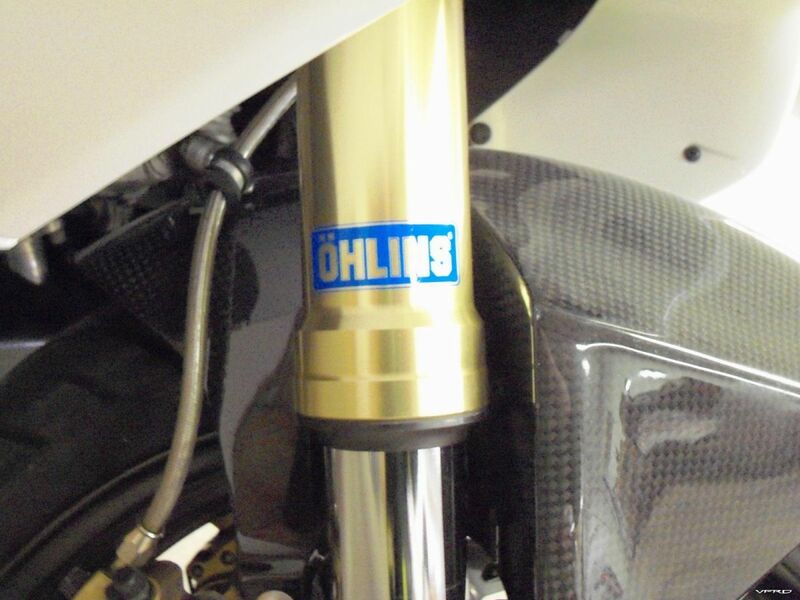 Nice, but now there will be a rash of cheap Ohlins forks popping up on eBay with Showa or Kayaba part numbers under the gold paint. I wanted to send them out for anodize, but that proved to be out of my budget. 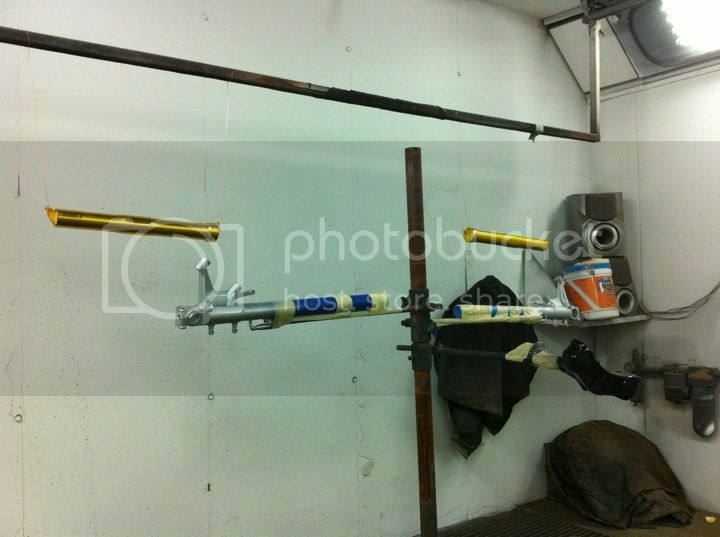 The quart of Kandy paint cost $50, the silver was left over from some other job so no cost there. Viffer93, the "Nohlins" ones would be pretty funny, do you really have some or were you kidding? 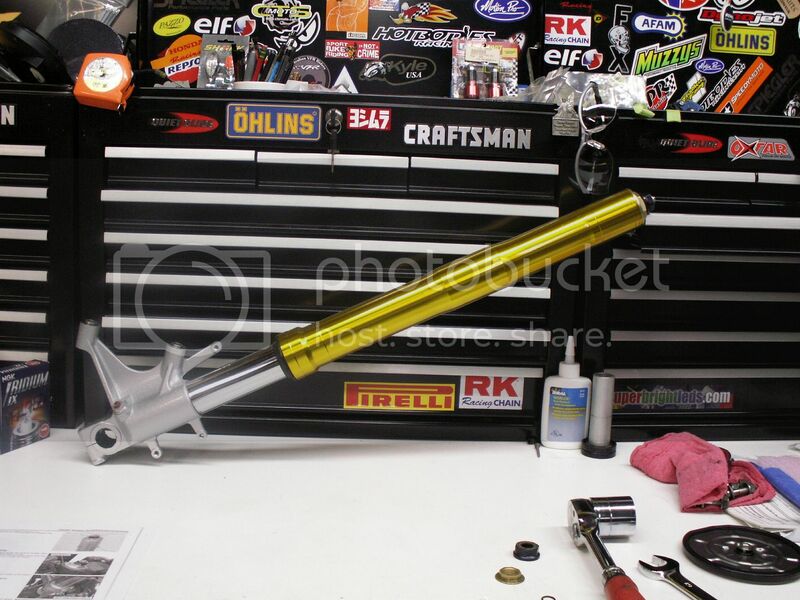 Do you anticipate any problems with stiction or any other problems resulting from the finish maybe not being as smooth as the original coatings on the forks? I didn't make any alterations to the fork tube itself, just cosmetic changes on the outside of the slider and the fork bottom(these are USD forks). Well, I was kind of kidding. 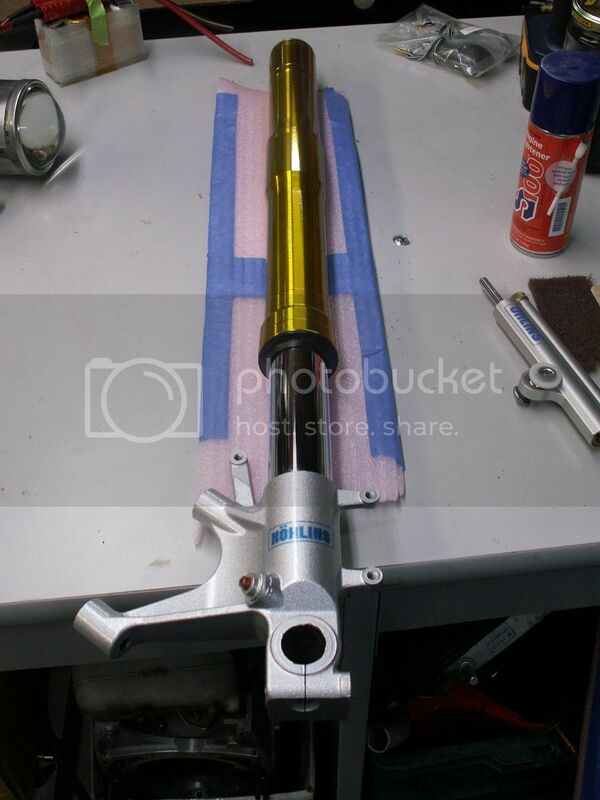 I am going to have some made up because I have those R1 forks with the Ohlins springs. I will let you know. In that case, I'll ask Throttlepimp if he'll make us some. How many do you want, and what size? PM me! 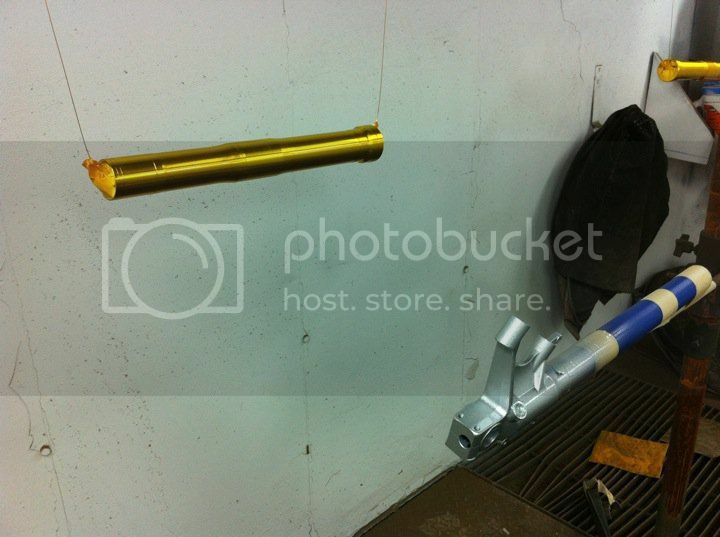 will the clamps ruin the paint job? and will it hold them with out making wrinkles?? i know you have to spread the clamp a little to get them in the bottom.. but will it hold them?? It should be fine. I've seen painted uppers done before, on non-trailer queen bikes, and it's held up. Yes, I'll have to spread the clamps a bit and maybe grease the tubes to slip them in easier and without scratching them. I'll let you know on the decals. 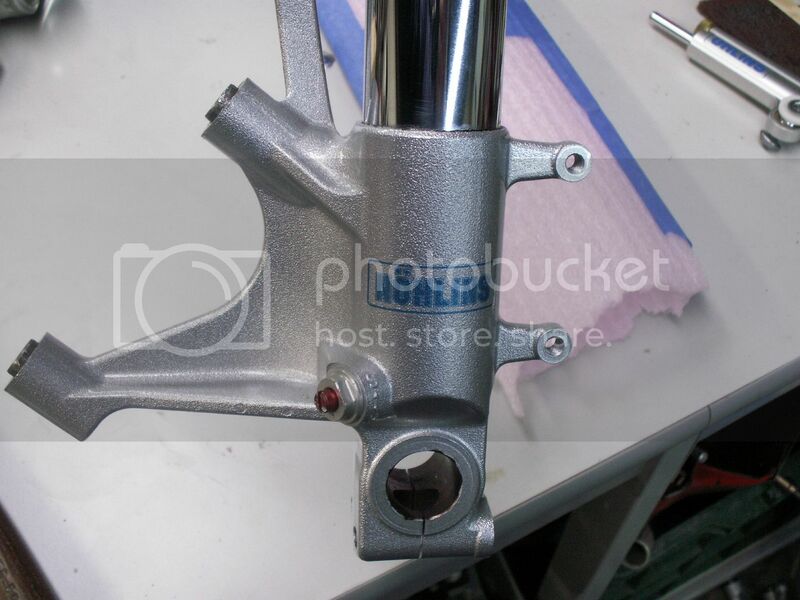 How did that cost compare to Powder Coating? Same, more, less? You, sir have some talent. The cost will likely depend on who does the coating. 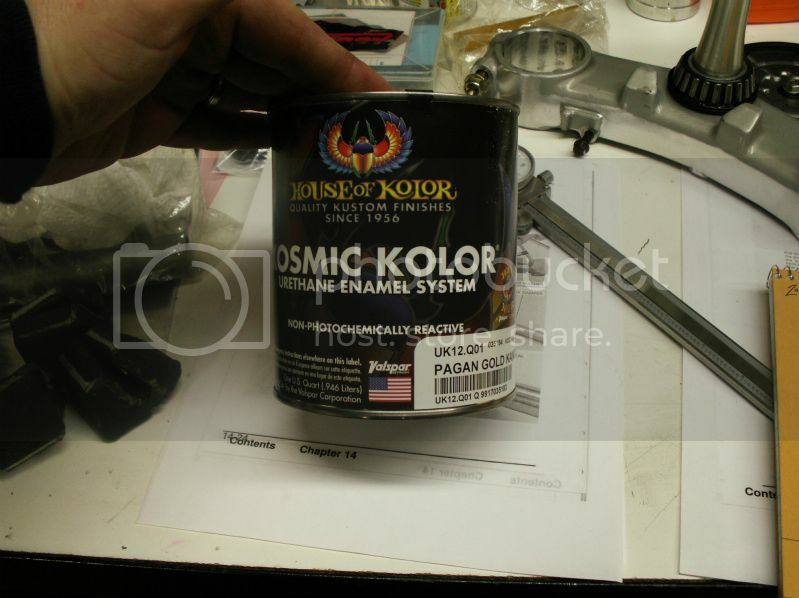 The guy that I'm using now doesn't know of any powders that are a match for the gold anodize look, although there is "talk in the PC community" of developing such a powder. ...the "Nohlins" ones would be pretty funny, do you really have some or were you kidding? Like the guy up the street from me who painted his Sears lawn tractor green with yellow trim and lettering and logoed it as a JOHN DOE. Close, but no trade mark infringement. In case anyone wants to know, I prepped the tubes with scuffing paste and a grey(fine) Scotch-Brite cloth, then they were shot with 4 light coats of the Pagan Gold kandy which was mixed with an extra .5 part of reducer to thin it out more. I'll post more pics of the forks after I get them assembled.